Engineers at Picatinny Arsenal in New Jersey successfully concluded a demonstration of its new anti-UAV platform recently by, you guessed it, blowing a pair of airborne drones clean out of the sky from a kilometer away. However, unlike other anti-drone weapons like the Phalanx or C-RAM systems which throw walls of hot, explosive lead at incoming threats; or the laser-based HEL-MD, this new weapon takes a more old-school approach: lots of big friggin' bullets. The as-of-yet unnamed weapon was developed as part of the Army's Enhanced Area Protection and Survivability (EAPS) Technology Objective at the U.S. Army Research, Development and Engineering Center. 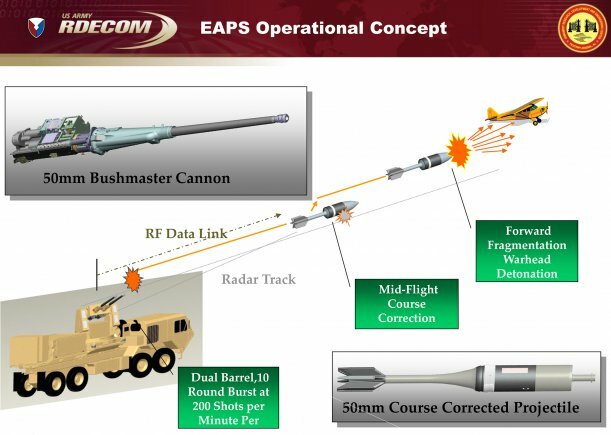 As such, it's been temporarily dubbed the EAPS ARDEC gun. It employs a pair of 50mm Bushmaster cannons mounted atop a Heavy Expanded Mobility Tactical Truck (HEMTT). These batteries fire 10-round bursts of unpowered steel projectiles wrapped in a tantalum-tungsten alloy liner that shred inbound UAVs, mortars and rockets. Each projectile can be passively steered while in flight using a radar command signal to ensure that it hits. "In order to minimize the electronics on board the interceptor and to make it cheaper, all the 'smarts' are basically done on the ground station," EAPS project officer Manfredi Luciano said in a statement. "The computations are done on the ground, and the radio frequency sends the information up to the round." The final demonstration occurred on August 19 at the Yuma Proving Ground in Arizona. During the demo, the system shot down two Griffon Outlaw drones. The gun is still in its prototyping stage though ARDEC is looking into adapting the technology into future weapons systems.